Like many around the world, I enjoyed watching the Winter Olympic Games. I love the fanfare of the competition, tracking medal counts and seeing well-known athletes winning gold again. Shaun White is my hero! One of the other things that I love to see is the camaraderie among the athletes and how they relate to their coaches. I can’t help but wonder about the feedback they receive from their coaches in between each competition. You can do it! Don’t think about the last score, focus on what you do best. Next time go higher, faster, longer. Remember everything we practiced and most importantly have fun. I can only imagine the observations, evaluations, words of wisdom and encouragement that the athletes receive. It makes me think of the importance of feedback in public relations – from the media, regarding writing and most importantly with clients. So what, exactly, is it? The term ‘feedback’ is used to describe the helpful information or criticism about prior action or behavior from an individual, communicated to another individual (or a group) who can use that information to adjust and improve current and future actions and behaviors. When a public relations person pitches a story to our editorial contacts, best practices dictate that we have done our research. We know who the audience is for the publication, what topics the editor or reporter likes to cover, and we structure our pitch in a way that should be compelling enough for the editor to want to write the story. But that is not always the case. Sometimes there is a piece missing to our pitch or an angle that would be more interesting to the editor. Sometimes their focus has changed or it’s just bad timing. Without specific feedback from the editor, we might not know how providing a customer or fresh data to support our pitch would be what is necessary for a compelling article. PR people like to please and we are aggressively working to get coverage for our clients. We will jump through hoops to get the additional information for an editor to meet the deadline and to get the coverage. Knowing is the key. The same is true with writing. It is such a subjective form of expression. Haven’t you had an experience where you really like someone’s writing style and other experiences where you didn’t? It doesn’t mean that it wasn’t an effective form of communication. Feedback in writing for public relations is so very important from basic editing and proofreading to ensuring accuracy. When you’ve worked on an article for hours, sometimes a fresh set of eyes is needed to see obvious mistakes that you overlook. We rely on our clients as experts in their field to make sure what we are communicating about their company, solution and industry segment is correct, especially if it is a new area to us. Feedback in writing will always produce better content. The most important feedback of all quite often comes from the relationship with our clients. We are here to work with you as your partner and to provide a service. For us to be effective, we need ongoing, regular feedback and information. And quite often, it goes both ways. We regularly provide our clients feedback on positioning, making the best use of your marketing communications budgets, and what is newsworthy and what isn’t. Treating us as part of your team makes for the best client relationships and leads to outstanding results. It is effective listening. It’s important that the person providing the feedback know that they are being understood and that it provides some value. It can motivate. By asking for feedback, it allows the receiver to perform better. It can improve performance. Feedback should be constructive criticism and is the best at helping to formulate better decisions to improve and increase performance. It is a tool for continued learning. Feedback is important across an entire organization to remain aligned to goals, create strategies, develop service improvements, improve relationships and to continue learning. Feedback should not be uncomfortable. Regular, positive or constructive feedback motivates everyone to perform better from award-winning PR teams to medal-winning athletes. So, when working with your Amendola PR team, remember the importance of feedback. It makes us all more effective and like our Olympic athletes, we all want to win the gold. Go Team USA! When Worlds Collide: Is the Merging of PR and Marketing a Good Thing? Before social media, cross-platform campaigns and general business trends toward greater economy and efficiency of services, public relations and marketing—though often collaborators—were two distinct disciplines. Despite a kind of “kissing cousins” relationship, each had its own mission and purpose. In today’s world, however, public relations and marketing are connected in ways that are both complex and granular. How effectively these well-blended professions work together is key to positively and creatively positioning your business for success. It used to be that marketing handled advertising and PR handled earned media. Both jobs required that they make the business look good. That’s still true today… kind of. It depends on how you look at it, and even then it can be hard to explain. Let’s start with a visual—the Rubin’s vase. This is a rather famous optical illusion that is usually depicted as a simple black-and-white image that can be interpreted differently depending on who is looking at it. One person looking at the image may see the shape of a vase, while another might glimpse two faces in profile facing each other. 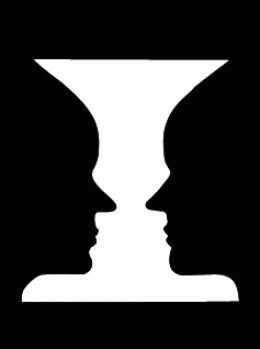 The person who sees the face can eventually see the vase, and the person who sees the face can see the two profiles, but neither person can they maintain both images concurrently. This is what PR and marketing used to look like. Marketing helped move the company’s product (two faces), while PR sold the “vase”—in the form of the company’s brand and reputation. Today, those distinctions are not as stark. Businesses are expecting their PR and marketing teams to find a way to see two faces and a vase at the same time. Like never before, PR and marketing need each other to help a business succeed. OK, so the average business executive may not really care about whether PR and marketing represent a single entity or distinct areas (after all, they care about results, which as we know, always fall freely from the magical Results Tree). It’s OK—we’re used to it. But you should care. More than anyone else in the company, the PR and marketing teams orbit in close and consistent proximity to your customers. Understanding how they best work together can make or break a business. If they are not on the same page, your company will not be on the same page with the customer. One of the reasons why PR and marketing are “colliding” is that in today’s environment content is king. Byline articles, blog posts, tweets, status updates, e-mail blasts. It seems that every new piece of content is “old” by the time the final stamp of approval is given. Campaigns—highly customized to the business or even a specific initiative within the enterprise—maximize your business’s core messages. But they also act in a way to bring a measure of control, discipline and meaning to the tsunami of content most businesses need to produce to stay relevant in hyper-competitive industries. The success of these campaigns often hinges on how well marketing and PR work together. With any initiative, the Golden Rule is “early and often.” This means that your PR and marketing pros need to engage early and often in order for the client to enjoy the end result (capitalizing on the success of a campaign or initiative). PR and marketing teams feed on data—both internal (from sales, product developers, c-suite executives) and external (customers and market shifts within the industry). That data will ultimately define the functional aspects of a campaign (the best vehicles and channels to reach prospective customers) and the emotional resonance (how the precise positioning of a message impacts a customer and their willingness to buy from and stay loyal to the business). When I start with a new client, one of my first goals is to get to know the marketing team and what they are working on. I also ask to engage with the sales team. What are customers connecting with? How do they interact with the company? And I don’t accept stock answers. I drill down. Sometimes, a turn of phrase or just the right word can be the different between a lost sale and a signature on the dotted line. Years ago, I might not have thought to do this. Today, I understand that the data I acquire from them will inform the shape of my PR campaign. I also understand that my PR campaign will affect everything on their side—from sales presentations and the keywords and phrases used in a brochure to social media campaigns and the priorities on the content calendar. Marketing and PR, while still very much distinct, are travelling toward the same goal and often taking the exact same road. There are the occasional places where the two diverge, but understanding those subtle differences is where true collaboration—and the success of your business—lies. When health IT professionals head to HIMSS, interoperability will be a major issue, as it has been for many years. Various interoperability solutions are always on the horizon, but never quite come to fruition. The reasons go beyond technological capabilities; healthcare organizations and IT vendors have simply not been able to think outside the box of their preconceived notions. A classic example is the recent announcement by a very large EHR vendor of new enhancements to its interoperability solution that allow providers who use that EHR to collaborate across organizational boundaries. Now, it’s all to the good that a clinician in one healthcare system will be able to not only view patient data in a different system’s EHR, but will also be able to schedule appointments more efficiently and message providers in the other healthcare system about a particular patient. However, a user of that EHR will still not know that a patient got a flu shot at CVS or was admitted to a hospital ED that doesn’t have that EHR. In fact, except for the exchange of hard-to-parse clinical summary documents, the provider won’t know about anything that happened to the patient in care settings with disparate EHRs. The central problem here is that the major health IT vendors would like their customers to use only their products and no one else’s. They’ve managed to convince some organizations that “rip and replace” is the solution to their interoperability ills. It is, however, no panacea. Aside from being a very expensive approach that disrupts the organization for a year or more, a unity system cannot provide all the functionality that healthcare organizations need, and the big vendors are not very amenable to connecting with third party app vendors. The advent of Fast Healthcare Interoperability Resources (FHIR) promises to allow EHR users to expand their functionality through third party apps without having to pay for special interfaces. To their credit, the big vendors have shown some flexibility by letting outside vendors play in their digital sandboxes and develop FHIR-based apps. However, the majority of these apps are being used mainly for viewing EHR data. Moreover, FHIR has still not solved the problem of EHR-to-EHR interoperability. So what is to be done? I’d suggest that, for starters, ONC and the private consortia working on interoperability consider a different role for EHRs that was suggested by Mandl and Kohane in a New England Journal of Medicine article. In that piece, the authors predict that with the spread of open standard software APIs, EHRs might become commodity components in a larger platform that includes other transactional systems and data warehouses running myriad apps. These apps could have access to many sources of shared data beyond a single health system’s records. To visualize what this means, think about all the apps you have on your smartphone. Many of these apps work together. For example, Uber uses your GPS to figure out your location, as do shopping and movie apps. Your calendar app knows what time it is in your time zone. If an EHR could contextualize all of the data coming into it from different apps, and combine them in ways that support medical decision making, it would be a much more useful program. It would maintain its role as the center of clinical workflow and documentation, but outside apps could also improve those functions, making the EHR more usable for clinicians. That’s all very fine, and the same system might be used to expose EHR data to apps that consumers could use to monitor and maintain their health. But how do we achieve interoperability between EHRs? I don’t presume to have the answer, but I have a couple of suggestions. First, health information exchanges need to step up their efforts to link together healthcare providers that use different EHRs. Some HIEs have focused on providing more analytic support to customers, which is certainly important but doesn’t meet the need to make a broad range of outside data available within the EHR workflow. To the extent that HIEs expand the types of data they can exchange, they will become more valuable. And if they adopt the emerging FHIR-based APIs, they will eventually find ways to exchange relevant data at the granular data level. Interoperability at a granular, discrete data level must move beyond interfaces between disparate systems, which are too expensive to set up and maintain. The holy grail would be to develop the ability for EHRs to generate some kind of standard data set—far more extensive than today’s CCDAs—that would be both machine readable and understandable to clinicians using any other system. Perhaps FHIR could do that someday, but it would still require some kind of universal network to distribute the data. Maybe blockchain or some other secure peer-to-peer system will meet this challenge. That’s all my crystal ball shows me today. But if the past is any indication, something totally unknown lies outside the box of the future.